The current issue of the journal Weed Science reports on the possibilities of manuka essential oil as a natural herbicide. 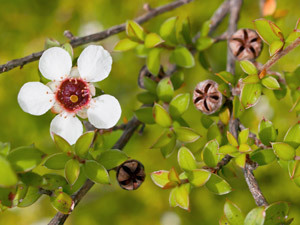 Distilled from the manuka tree (Leptospermum scoparium), this essential oil showed good results in field tests as both a preemergent and postemergent herbicide. Field tests were conducted in Stoneville, Mississippi, against crabgrass, velvetleaf, pigweed, and other species of broadleaf and grass weeds. Manuka essential oil contains natural beta-triketones, which target the same plant enzyme as some commercial synthetic herbicides. With this component, small amounts of manuka oil can be combined with a commercial organic herbicide of lemongrass essential oil to achieve greater results. In this study, this combination made the lemongrass essential oil more potent in postemergent applications, causing as much as a 94 percent reduction in dry weight of remaining crabgrass collected. However, it is the potential of manuka essential oil as a preemergent treatment that makes it an attractive option for developing a new natural herbicide. Large crabgrass growth was reduced 50 percent to 90 percent in the current study, depending on the dose of manuka oil used. No other essential oil currently in commercial use for weed control has shown such strong activity. Agrochemical companies are looking for “greener” options to meet market and government demands. This study found that manuka essential oil and its main active ingredient, leptospermone, were stable in soil for up to seven days, with half-lives of 18 and 15 days, respectively. This longer-lasting, but natural, effectiveness opens more possibilities for this oil in both organic and conventional farming. Learn more about Manuka essential Oil.